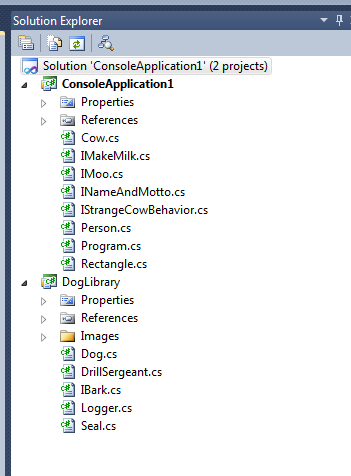 When you work with Visual Studio to develop an application, you organize your source code into projects and solutions. Projects contain items such as your source code files and typically are configured to produce a single deployable object at build time, like a Console Application (.exe), WPF Application (.exe) or a Class Library (.dll). A project is something that you can build individually, generating the desired output (like an .exe or .dll file). Solutions act as containers for projects. You can perform certain operations, like building the software, for the entire solution. When you open Visual Studio, you typically open a solution. You then use the Solution Explorer to view and manage items contained in projects within that solution. The example below shows a solution (ConsoleApplication1) that contains two projects–a Console Application packaged as an .exe file (ConsoleApplication1) and a class library packaged as a .dll file (DogLibrary). It may actually be worth mentioning (maybe as a separate bit) that the same project may belong to more than one solution. Let’s say, you may have one solution with all the projects, and another that excludes the deployment projects.